I’ve decided that this is the year I’m going to try something new in fantasy sports play. Although I love playing for Louboutins in my season long all girl fantasy football league, I’ve decided that it’s time to up the ante. And even though I find the commercials ridiculous and the advertising just WAY too much (hello staring at 4 consecutive Draft Kings billboards while waiting for the T-pretty annoying), something has tempted me into the world of daily/weekly fantasy football. What was it? Easy. 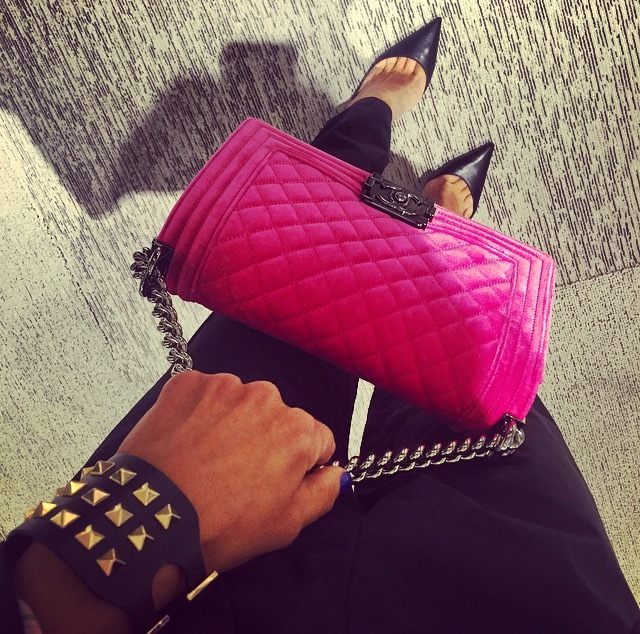 It was this uber-fabulous fuchsia Chanel boy bag. Cash for cash sake and/or bragging rights aren’t motivating for me. This stunning bag that’s a wee bit (ok a lot) out of my budget at the moment, now that is serious motivation. All I have to do is use my skills at fantasy football, put down a bit of money and see what happens. Sounds like a bit of a challenge and a lot of fun. Got the death grip on it as I take it for a spin around Chanel. This week I’ll be diving deep into both Fan Duel and Draft Kings daily and weekly play and reporting back every step of the way. I’m playing for the bag, not the brag. Heck I wouldn’t need to brag. This gorgeous bag will take care of that for me. Are you playing fantasy sports this season? I’d love to know if you are and if not, why not!